One man’s trash (recycling, natch) is, for Scott Wiener, the stuff of book deals. 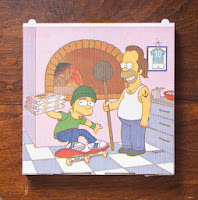 Last month, Melville House published Viva La Pizza: The Art of the Pizza Box, a Technicolor—and surprisingly technical—survey of the many permutations of an artifact that is arcane as a matter of intellectual inquiry but abundantly common outside the academy: the titular pizza box. How many permutations? 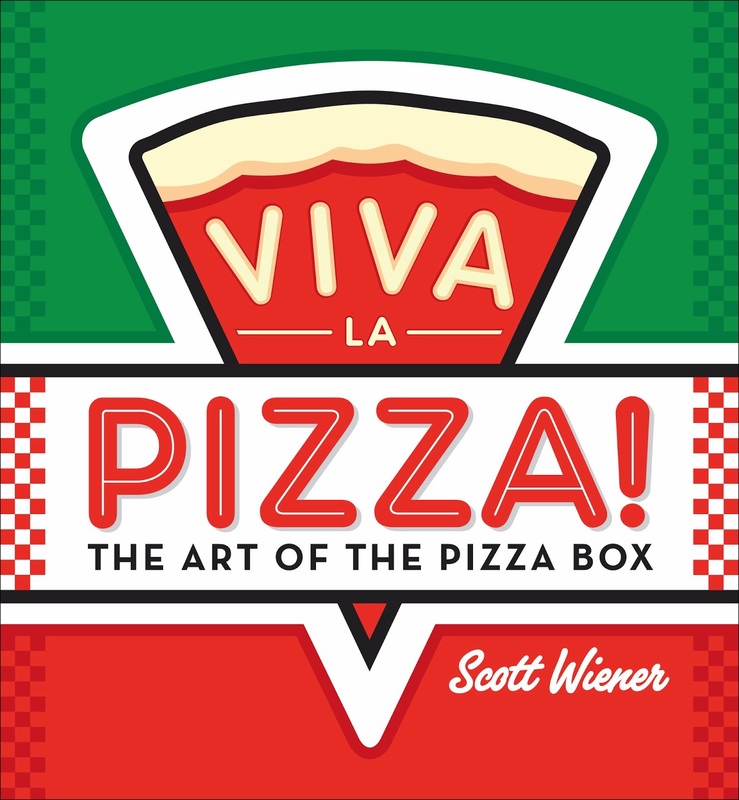 Well, Scott Wiener in his singular quest has collected upwards of 600 pizza boxes, though the book couldn’t nearly contain all the gems he’s procured. And don’t worry too much about the rodentia and insecta that would seem to accompany such a assemblage; the mere 4% that did once carry pizza have been scrupulously scraped free of mozzarella goo and tomato sauce tracks. When I caught up with him last week, he joked that he spotted only “one rat and three mice” around his piles of boxes. Since 2008, Scott has conducted tours of New York pizzerias, and when he ventures beyond the five boroughs to pizza-loving locales like Chicago, Italy, Israel, or California, the trips are “pizza influenced,” all a part of his “grand scheme” to contribute as much as possible to the “general pizza understanding.” I forgot to ask if he ever got sick of eating so much pizza, probably because he so obviously doesn’t. As for the boxes, Scott says he was drawn to this “utilitarian object with a design element,” something that is interesting to him because it shouldn’t have a whole story behind it, but does. There’s a touch of evangelism in the way Scott talks about converting skeptical industry types into “born-again pizza-box lovers,” and how his book has garnered some attention for the local designers whose work is usually overlooked in favor of the steaming cheesy crusty melty treasure within. Wiener tells me that the book itself could’ve just been a pretty thing with lots of photos—and it is that—but that if you read the actual text it’s a whole different book, a multilayered inquiry into a single subject, in the tradition of books like Bee Wilson’s Consider the Fork and Mark Kurlansky’s Salt, two authors whom Wiener reveres. After talking to Wiener, I know that next time I order pizza, I’ll pause for a moment to appreciate the cardboard tableau before I lift the lid. Here’s what else Wiener had to say. 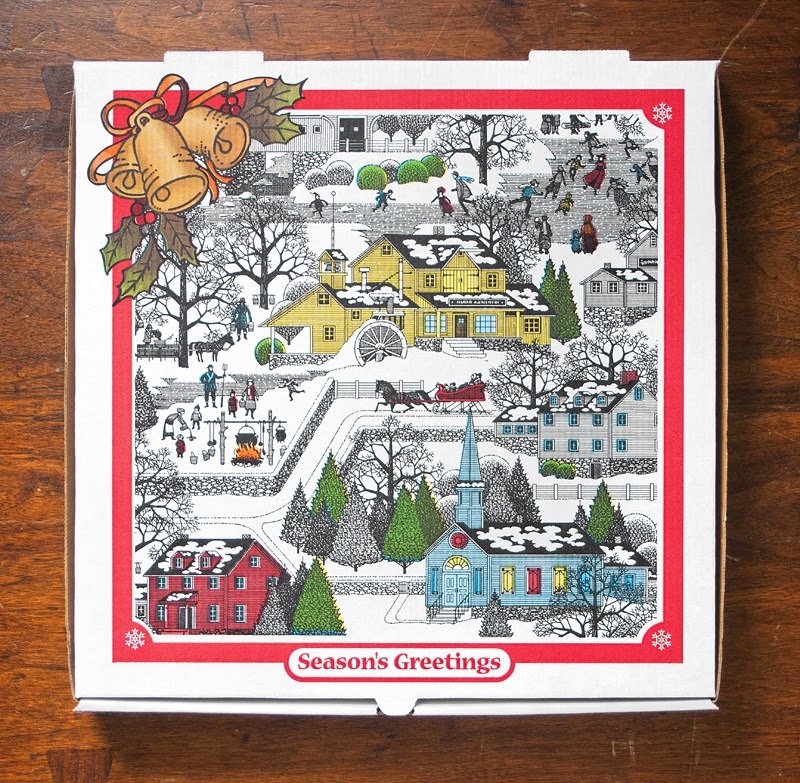 Everyday Genius: How did your collection of pizza boxes begin? Scott Wiener: I started collecting boxes in 2008 because I saw a beautiful box while on vacation in Israel. All our boxes in New York look the same -- white boxes with red printing. The box I saw in Israel was yellow with blue writing. Very interesting! So I started noticing boxes more and more, then began to save boxes that looked particularly interesting. 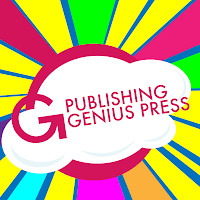 EG: At what point did you figure out this could be a book? SW: Every time I tell people about my collection, they are confused because they don't understand how pizza boxes are something you can collect. Then I show them photos of the boxes and they get interested. I've always wanted to compile the most interesting boxes into a book and when Melville House approached me about doing a book about pizza boxes, I was ready to go. EG: What is the strangest place that your quest has taken you? SW: I get some of my best boxes from friends and Pizza Tour customers who send me boxes from all over the world. My friend Barbara sent me a box from a trip she took to Cuba. Pretty amazing! 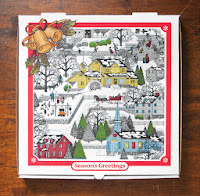 EG: What is something that has surprised you about pizza boxes? SW: I'm always surprised when I see how generic boxes from different parts of the country. Different printers use different images so it's interesting to trace those patterns around the world. EG: Do you have any dream boxes that you have yet to procure? SW: I've always wanted to find a Teenage Mutant Ninja Turtles box from when the original cartoon was on. Not sure if they even exist but that's one I'm always looking for. 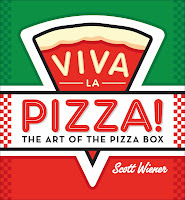 I named the book Viva La Pizza because it was written on a pizza box my publisher found ten years ago but I have personally never seen the box. I'm always looking for that one! EG: What does a pizza box tell you about the pizza that's inside? SW: Two-color boxes (red and green usually) are more classic, so the pizza is likely more traditional Italian-American fare. Funkier color combinations (pink, orange, black, etc) usually indicate that the pizza will be more modern. EG: Do you have any peers or competitors in the field of pizza-box scholarship? SW: Hahaha I don't really know of anyone else who collects pizza boxes but I'd love to meet them! Outside of the actual pizza box industry, there aren't too many people who study pizza boxes.